Perhaps the worst thing about malware is that there may often be no sign that your computer is affected. Viruses can remain on your computer, silently recording your information - bank transactions, passwords, etc - and sending them out. A virus might corrupt or delete data on your computer, use your email program to spread itself to other computers, or even erase everything on your hard disk. Run a suite of programs to detect and remove all forms of malware. Test your anti-virus protection to make sure it has not been compromised. Innoculate your computer against Cryptolocker. Create a backup of essential data to a DVD/R disk. Often when browsing you may see a warning like this. Its a rogue telling you you have a virus. You dont - but click on this and you soon will have. 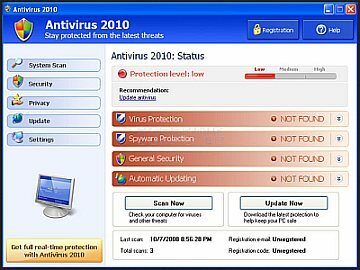 Rogue anti-virus programs can disable your real anti-virus and open the door to all sorts of nasties - while making you believe you have effective protection. If you see this on your screen you have REAL problems. 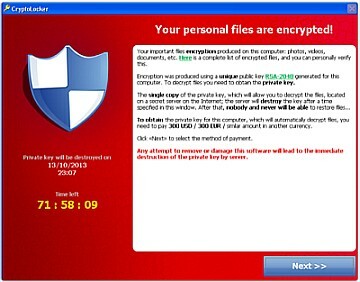 The cryptolocker virus has infected your computer, and encrypted all your files. Your only hope is to restore from a protected backup. You do HAVE a backup, dont you? Anything that transfers data to your computer can bring malware with it. Browsing the web, picking up email, installing a program - even plugging in a memory stick. Computer viruses are often spread by attachments in email messages or instant messaging messages. That is why it is essential that you never open email attachments unless you know who it's from and you are expecting it. Viruses can be disguised as attachments of funny images, greeting cards, or audio and video files. if you plan to deal with the problem yourself, Follow THIS GUIDE to check for malware and remove it.